Amazon will add 120,000 seasonal employees for the holidays this year, up 20 percent from last year’s holiday season surge. It’s not unusual for companies like Amazon to add thousands of workers in the final quarter of the year. Big retailers are particularly in need of extra helpers during the holiday season because of the surge in online sales. Amazon’s increase in workers, however, is gigantic compared to its biggest competitors. Rivals Target and Macy’s will only hire 70,000 and 83,000 seasonal workers, respectively, according to a Wall Street Journal report. All three companies will focus on adding workers to warehouses and distribution centers, which focus on getting online orders ready for customers. In theory, adding tens of thousands of jobs is excellent for the economy, but the reality is these jobs can actually be pretty tough—and the working environments can be downright grim. Earlier this year, a Bloomberg report revealed how unspeakably awful it is to work in an Amazon warehouse, even after many aspects of the job have been automated. Warehouse workers have to walk between seven and 15 miles every day, enter and exit the buildings through airport-style security scanners that take 30 minutes to get through, and expose themselves to a litany of security cameras. Amazon also added flatscreen TVs to some of its warehouses to publicly shame alleged on-the-job thieves, showing when they stole, what they stole, how much it was worth, and how they got caught. Although the monitors do not use names and obfuscate people’s identities by making their images look like shadowy silhouettes, it still creates something of a dystopian atmosphere. 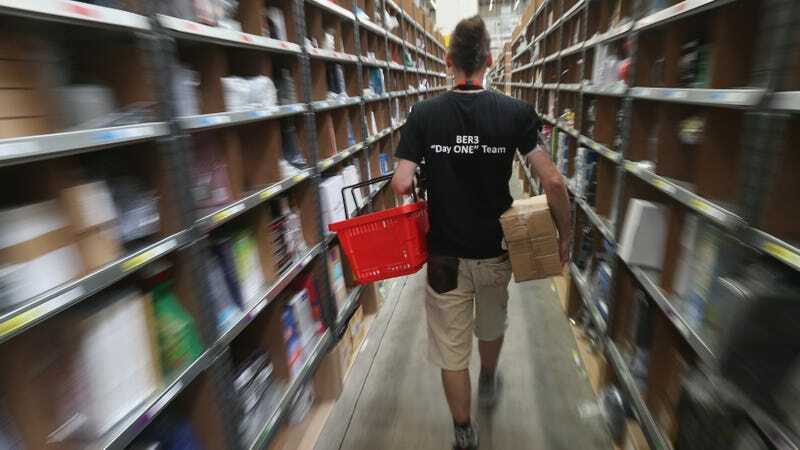 Have you been a seasonal worker for Amazon? Do you have a story about your experience? Get it touch: michael.nunez@gizmodo.com or tipbox@gizmodo.com. We are proud of the workplace we provide – in fact, we’d love for anyone to come see the great environment we offer at our fulfillment centers for themselves. Anyone can sign up for a tour and see our workplace firsthand at www.amazon.com/fctours.